Work on implementation of 36.8 km of metro, partly underground and partly elevated, has already been initiated by Bangalore Metro Rail Corporation (BMRC) along East-West & North-South corridors crossing at Majestic. These corridors will basically cover the most congested core areas of Banglore like Peenya, Gandhinagar, M.G. Road, Vijayanagar, Indiranagar, Majestic area, K.R.Market, Jayanagar, and Basavanagudi etc. Tables 7.1 give these Phase I Metro corridors. The above corridors may be able to give relief to the immediate traffic problems within the core areas and its immediate neighborhood but by the time the Master Plan proposals get implemented and development of areas beyond the outer ring road takes place in right earnest, the above system will fall short and a more extensive system will become necessary as brought out in Chapter 6. This is especially true because the Master Plan 2015 and its detailed Zonal plans propose the development of around 814.4 Sq. Kms. of area for various urban uses. This brings very large spread of area on which various urban activities will take place. They would now be located right upto the Peripheral Ring Road in practically all directions and at a few places even beyond it. These activities include some with huge employment potential areas like the Electronic City in the east and southern portions of the BMA. It is therefore necessary that the Metro gets ultimately extended to the most of the high density centers. Therefore the following additional corridors considering the projected travel demand are proposed to be taken up as extension of the Metro in Phase 2. The area to the south of Jayanagar consisting of J.P.Nagar Banashankari, Kumaraswamy layout are fully developed and quite densely populated. Substantial commutation takes place between these areas and core areas of Bangalore. BMICAPA has plans to develop residential and commercial activities along the Bangalore Mysore Expressway corridor, the North –south commuter traffic is expected to increase substantially. It is therefore being proposed that the already approved North-South corridor between Peenya to R V Road Terminal may be extended upto the PRR along the Kanakapura Road. This extension of approximately 10 km should be taken up in the first phase itself. The first phase of the East West line has been proposed from Baiyyappanahalli to Mysore Road. 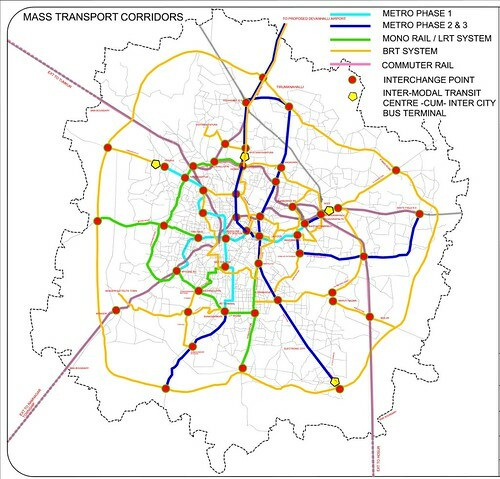 How ever as would be seen from the plan and the subsequent proposals, Outer Ring Road (ORR) is one of the most important spines of Banglore on which large city traffic converges and keeping this in view mass transport in the form of BRT/ Mono-Rail/ LRT is proposed on it in addition to its improvement and smoothening. Benniganahalli located just on the ORR is also the Rail station for the proposed Commuter Rail Systems on the intersection of Bangalore City Station – Whitefield & Banaswadi - BMA Boundary rail corridors. Thus, since it is a very important transport node where a number of transport modes i.e. BRT, CRS etc., meet it, can act as an excellent inter-modal interchange. Therefore it is proposed the east west corridor is extended from Baiyyappanahalli to Benniganahalli through a distance of 1.5 km in the first phase itself. The singular North-South corridor planned so far will mostly be able to cater to the western part of the city between Peenya and Kanakapura Road. However the development coming up on the eastern side between Hosur Road and white field – the I.T. 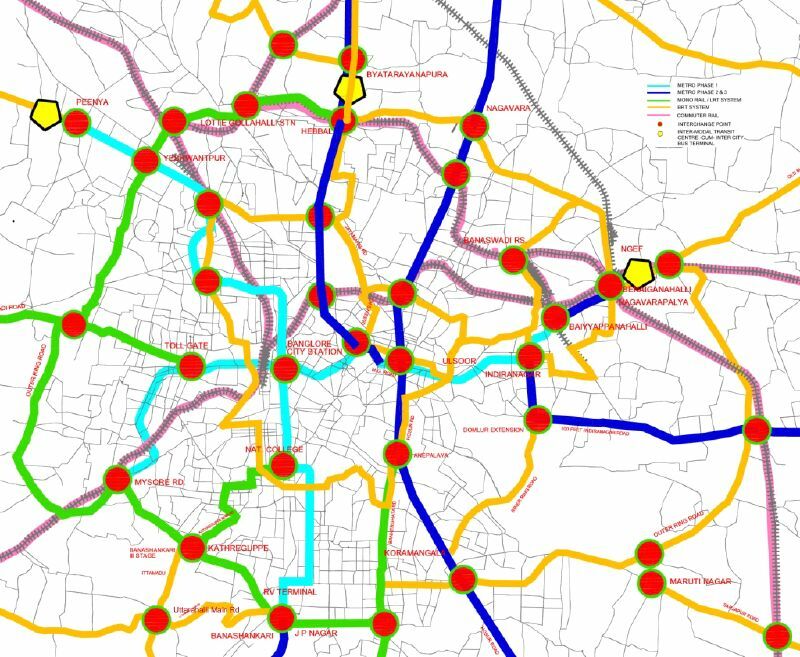 and the Electronic cities and in the Northern side near Thanisandra and Yelahanka need another north-south corridor. In order to meet the traffic demand of this area another 34 km long corridor from Yelahanka to PRR via Nagavara, Electronic City has been planned. This corridor will cover Nagavara, Veerannapalya, Frazer Town, the residential, commercial and industrial (IT Sector) areas along Hosur Road. This corridor will also have interchange with the airport expressway and airport metro to provide direct access from south and south east Bangalore to the airport. This will also at interchange with the East West metro corridor. The up coming industrial areas, I.T hubs and commercial developments near the White Field area, C.V. Raman Nagar and the commercial development along most of the roads in the Indira Nagar area have totally chocked the Airport Road and the White Field Road and by the time the I.T. hub is fully functional the traffic demand will require a Metro connection of the White Field area with the heart of the City. Accordingly a 19.5 Km. Metro link between Indira Nagar Metro station and White field is proposed. This link when completed would have an inter face with the Mysore Road - Benniganahalli east west corridor at Indira Nagar. i. City Airport Terminal: In police grounds on M.G.Road the CAT is planned and the metro ramp structure from Mink underground section to M.G. Road elevated section will pass through the CAT structure, integrating both systems. ii. Hebbal Check-in Station: The second check-in station has been planned at the end of the Hebbal fly-over towards left, with elevated cross-passage with escalator facility to cross-over from the bus-terminal being planned on the right side. The ease of access from the ORR will be able to attract large clientele to this Station. iii. Yelahanka Pickup Station: It is located at the junction of the N.H. and the Yelahanka Town Road. At this station luggage checkin is not being provided but passengers with hand baggage only will be able to board and alight the train. The above proposals of metro extensions have been consolidated and listed in the following table. These proposals would add up to about 100 Kms. of Metro to taken up in later phases. Thus ultimately it is suggested that approx. 137 km of network of Metro will be required to effectively serve the major traffic corridors and high density use areas to meet the travel demand up to 2025. This could be taken up in two phases. Corridors No 1 and 2 of the above Table 7.2 may be taken up along with the corridors indicated in Table 7.1 under implementation in Phase I, while the corridors Sr. No 3 &4 above may be taken up in the subsequent phase. In view of the pace at which the new Airport is constructed, it will be desirable to take up the Airport connection at S.No. 5 above in the first phase itself in order to make the same accessible as and when commissioned. These proposals are indicated in Figure 7.1.